I first caught wind of the Latest Recipe, Le Meridien Hotel's new cafe at last year's Food Bloggers gathering from Riz of Fried Chillies fame. Oozing praises for the new concept, he made it sound so tempting, I wanted to abandon the gathering and bolt straight away for the cafe. 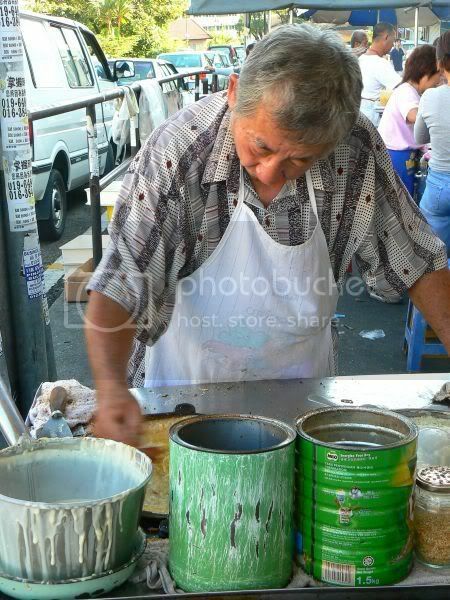 The magic word, he kept repeating was "Teppanyaki Ice Cream". Hold on, my brain was working out, "one can't fry ice cream on a teppan since it will melt right???" My curiosity was piqued hence, when I received an invitation to dine with Paprika, Lyrical Lemongrass and Cheryl Lum (thanks so much, Cheryl! ), the PR director of Le Meridien Hotel, I said " Yes" very eagerly. Come Monday night, I'm fighting through the Federal Highway traffic to get to the hotel. I guess the gods must be feeling kind that night since I arrived way before my appointment time. A good sign I reckon, plus I found parking quickly, even though the hotel was packed for a function. Once you enter the cafe, you will find it is an unusual round shape as the middle portion is taken over by the hanging glass mosiac. Unlike the traditional hotel buffets, here you find open kitchens with busy chefs behind yellow glass lit panels. Just above each counter is a lit panel depicting the type of cuisine - for instance, the Chinese counter had a picture of a junk in full sail while the Japanese counter had the snow topped Fuji Mountain and cherry blossoms. You'll find Malay, Indian, Chinese, Japanese and Western delights in their open kitchens. Opposite the open kitchens, you'll find the salad bar, seafood on ice, glass shelves filled with teeny weeny tapas appetizers and desserts, two chocolate fountains (the white chocolate one was out of commission that day), a dessert spread and their signature Teppanyaki ice cream bar (more on that later on). Being an avid Japanese food fan, I zoomed in on the Japanese counter. 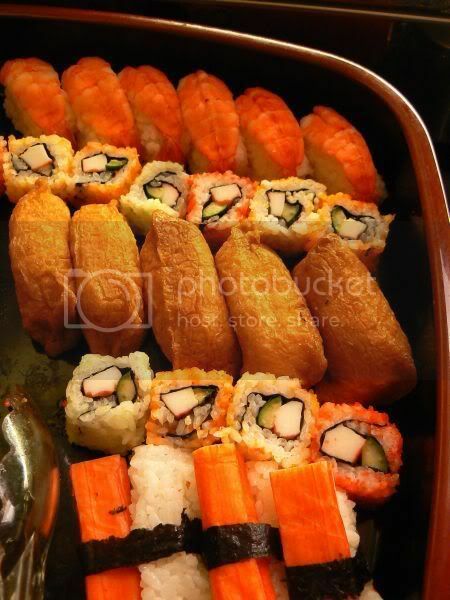 A selection of sushi, makis and sashimi is laid out for all to pick from. Soy sauce, pickled ginger and wasabi was also available on the same counter. Since I was saving tummy space for other tempting delights, I only tried the sashimi - maguro, salmon, octopus and butterfish. The sashimi was fresh but I didn't quite like how they sliced the fish - in small pieces, which made it so difficult to pick up with tongs. What I did like was the Teppanyaki counter next to it. You select from an array of beef, chicken, prawns and scallops for the chef to cook on the hot teppan. He adds a peppery sauce for the beef and a creamy sauce for the seafood, which was super delicious. 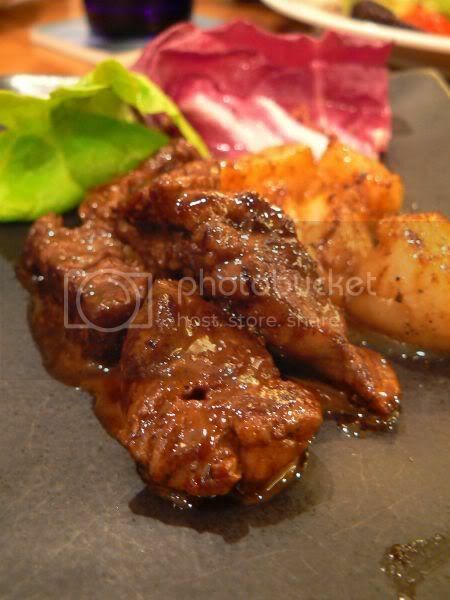 Thumbs up for the tender beef cubes and the springy prawns with the delish sauce. 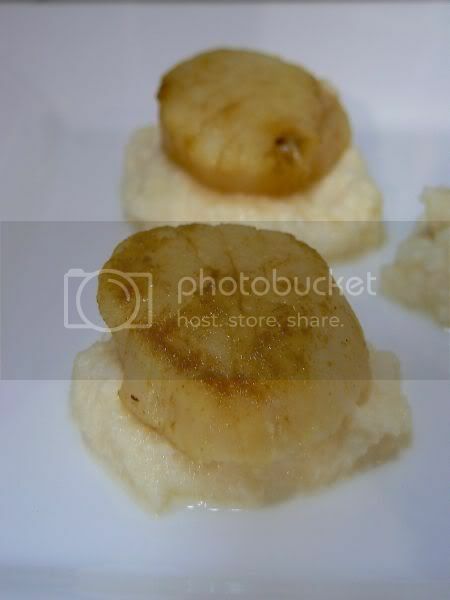 My only gripe is they tend to under cook the scallops. You can also get garlic fried rice here, cooked on the teppan. Cooked vegetables are also available and kept in a slow cooker to keep them warm. Next was the local Malay seafood barbeque. Choose from stingray, prawn, squid, bamboo clams and etc with your choice of sambal and dressings to be grilled on the spot. At one point, it got quite smoky with the grill producing seafood non stop. We had the grilled stingray wrapped in banana leaf and bamboo clams. Unfortunately, I found the fish to be dry while the bamboo clams had a slight sandy texture. The Chinese counter had a variety of noodles served with mee bandung, cantonese, curry mee gravy. However, we only managed to try the Shanghai Noodles. 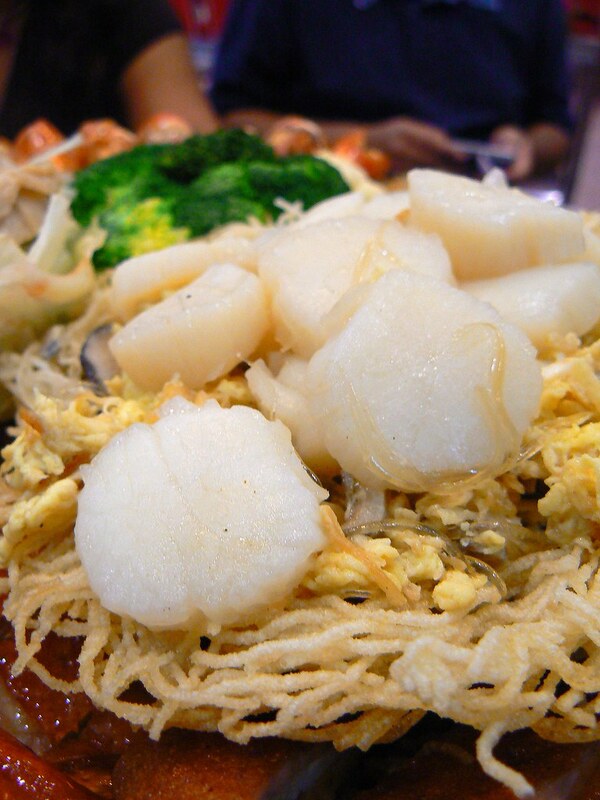 I really liked this as it reminded me of Loh Mee albeit less starchy. 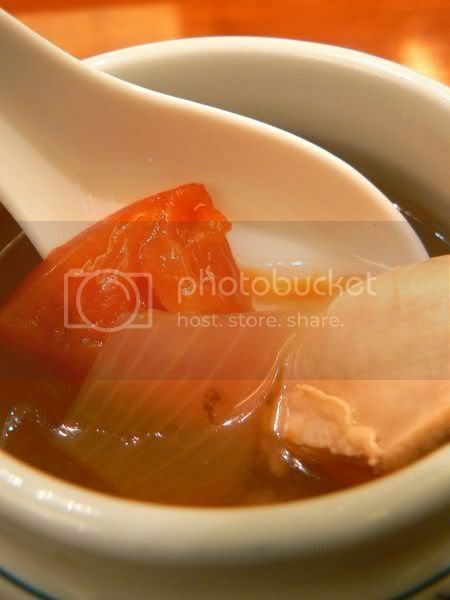 Served with thin noodles, the slightly starchy broth is filled with fresh seafood. 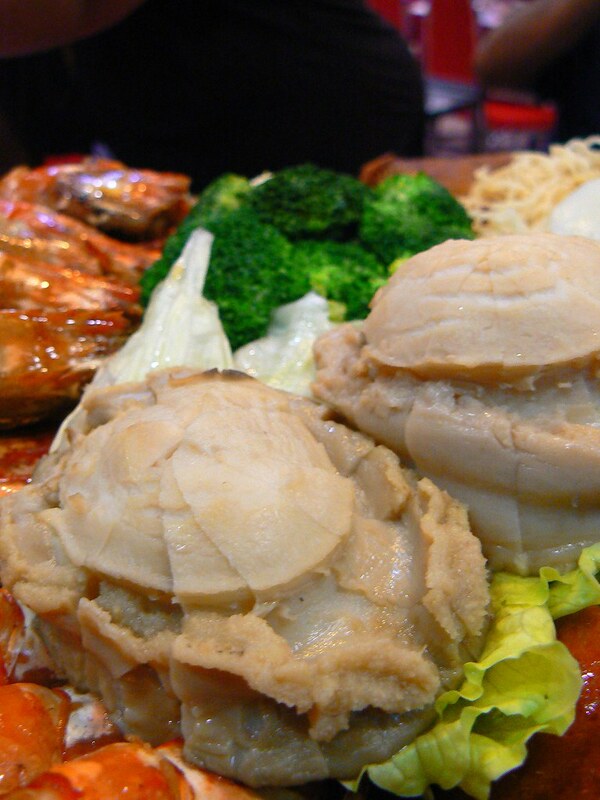 There's also chicken rice (steamed and roasted) and an array of steamed dim sum items. Although the siu mai was quite tasty, we did encounter a bad one in the form of sausages wrapped in har kau skin. The western section has a pasta counter - pick which type you like and the sauce you want them to cook it in. We asked for the chef's special and it was light tasting- squid ink fettucine served with aglio olio and squid rings, beef bacon, garlic and onions. A carvery with roasts and side dishes are also available. My absolute favourite was the Indian counter. 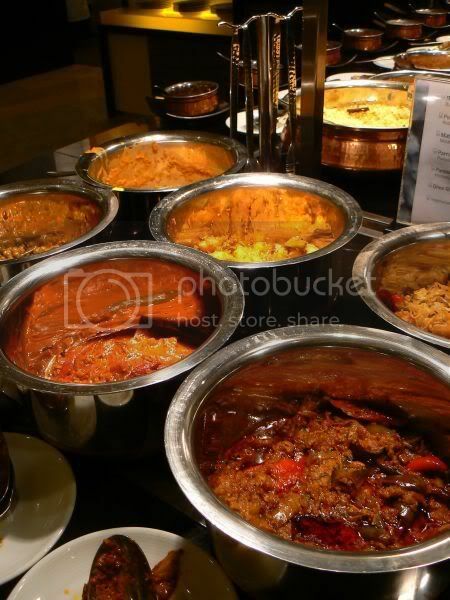 Rows of various curries and vegetables were laid out in gleaming brass pots. 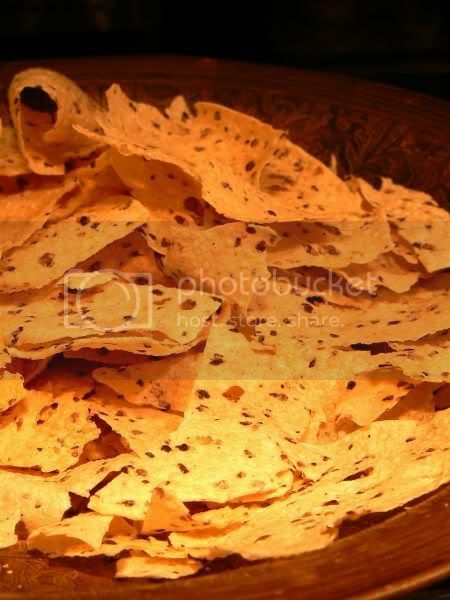 There is also a selection of pappadums, all tasting great. Briyani rice, tandoori items, chutneys, yoghurt mixed with vegetables were also available. 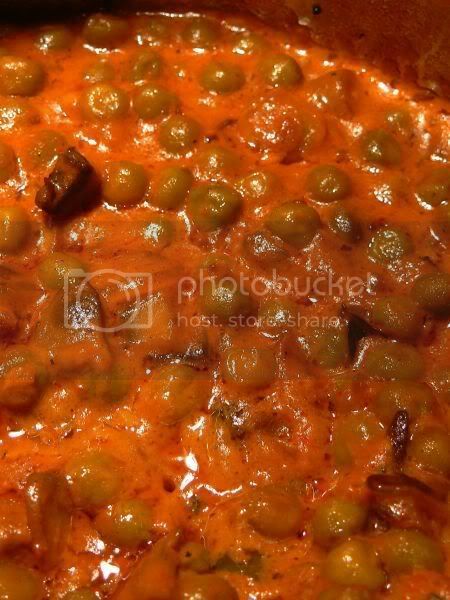 My favourites were the pea curry, the eggplants and the melt in the mouth lamb curry. The food tends to be quite spicy, so drizzle it with yoghurt, if you prefer a less fiery effect on your stomach. Right at the end is the soup section with bread. That night we dined here it was Sup Tulang, which finished so quickly we didn't even get a chance to try it. The array of food here is endless. 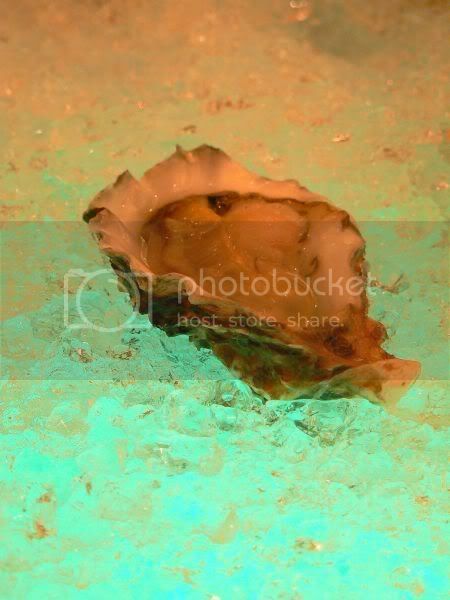 Opposite the open kitchens, you get fresh seafood on the ice - oysters, prawns, crabs and mussels. Just pick your choice, drizzled with lemon juice or tabasco. Cooked local dishes are also available at one side. 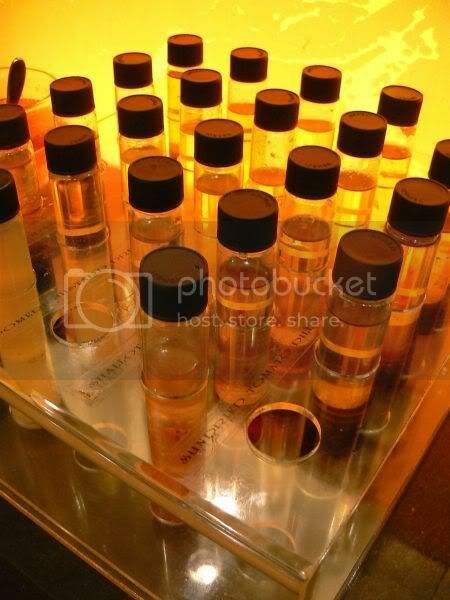 I loved the salad bar as it had a selection of salad dressings in test tubes. Pre-mixed by the kitchen, you take one from the tray and shake it well before drizzling on your choice of vegetables. If that doesn't satisfy you, mix your own from their selection of flavoured olive oil, balsamic vinegar and wine vinegars. There's a slight confusion on one end - shelves filled with tapas items. Some are savoury while the others are desserts. Since they look similar, one must be careful what you choose. Although they looked pretty, they didn't taste so great. A bit too experimental for my tastebuds for instance, creamy lassi with olives. 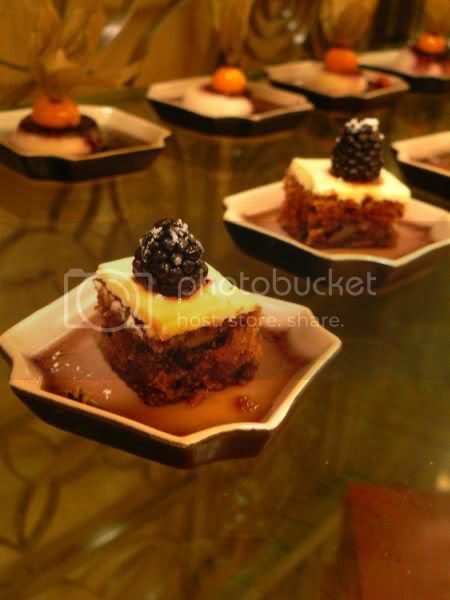 If you prefer, you can just have desserts for buffet at RM38++. Definitely a great deal especially if you have a sweet tooth since they put up a good spread of desserts. 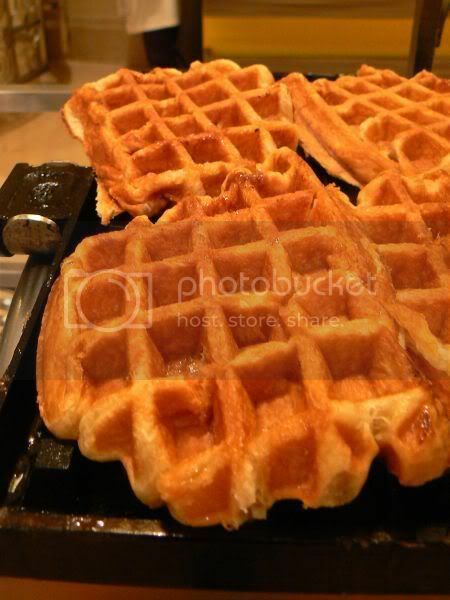 Waffles are available on the counter, just help yourself and choose from a variety of toppings - raspberry jam, peanut butter, mango, chocolate and raspberry sauce. 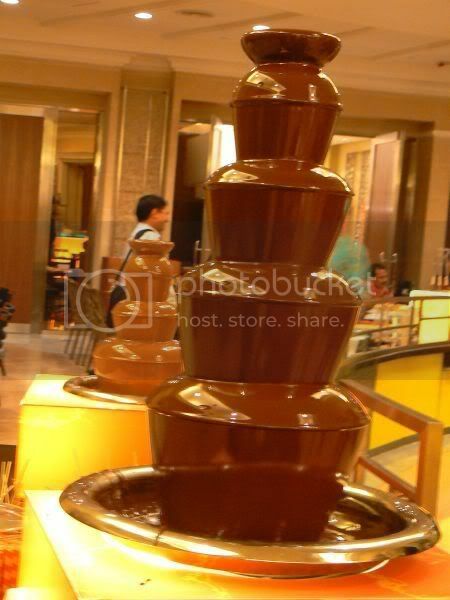 It wouldn't be a hotel buffet without a chocolate fountain. At Latest Recipe, you have a choice of two - milk and dark chocolate. Originally 3 fountains, the white chocolate one was not working that day. I loved the items given for dipping - big juicy strawberries, marshmallows with fillings (chocolate, lime, strawberry and etc) and brownies. There's also a selection of local and western desserts like madelines, mousses and puddings and local desserts on one counter, so take your pick. Last but not least, is the teppanyaki ice cream. Instead of a hot teppan, ice cream is placed on an icy cold plate. Select from the ice cream flavours - vanilla, chocolate, green tea and choose from the candy bar, your preferred filling. 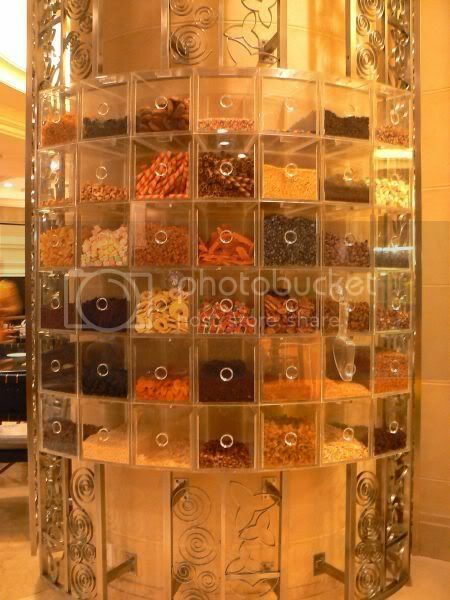 There's a variety of sweet treats - candies, marshmallows, wafers and etc. The chef will add the filling on the ice cream and using a special teppanyaki flat steel scraper, he will "cook" it on the ice cold plate i.e. mixing it around quickly. As the temperature does not drop quickly, this quick motion mixes the filling thoroughly. Once completed, he will scrape the mixed ice cream in a glass cup and add a topping you want - ground nuts, almond flakes, chocolate rice and etc. We had the green tea ice cream with coco crunch. It nice with the crunchy bits but the green tea taste of the ice cream was not strong enough, making it a bit dissapointing. Overall, I thought the buffet served a wide variety of items with some hits and misses. The choices were mind boggling especially since we didn't have so much tummy space. The hits for me was their teppanyaki items especially the seafood items served with the sauce. Just remember to ask them to cook the scallops a bit more as they tend to undercook it. 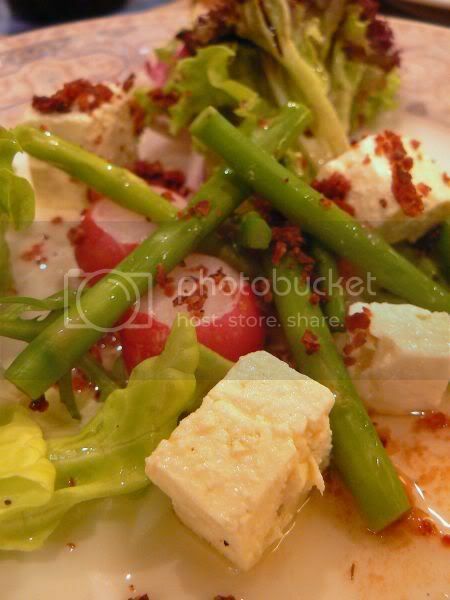 I really liked the salads with the interesting dressings, flavoured oils and vinegar. Brings a new dimension to salad leaves. I liked the Shanghai Noodles and would not mind having a second helping. Also good is their pasta dishes cooked a la minute with your choice of pasta and sauce. My absolute favourite was the Northern Indian food - so utterly delish, authentic (Lyrical Lemongrass gave it the stamp of approval) and worthy of a few helpings. 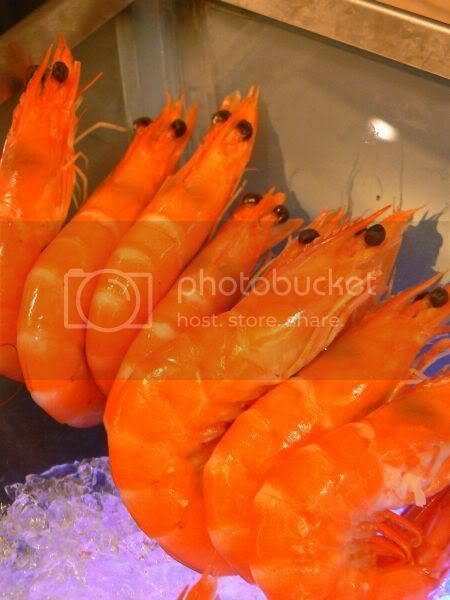 However not everything was good on the buffet line like the Malay section with their seafood barbeque and the scary looking colourful dim sum, which tasted oily. For desserts, I liked the chocolate fountain especially the marshmallows with fillings, which you dip in the luscious chocolate. I found the Teppanyaki ice cream to be quite unusual and definitely a new concept. 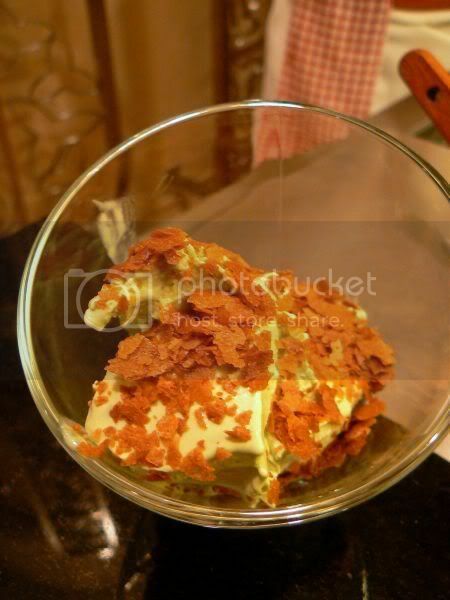 However, it was a slight let down as the green ice cream should have had a stronger flavour. 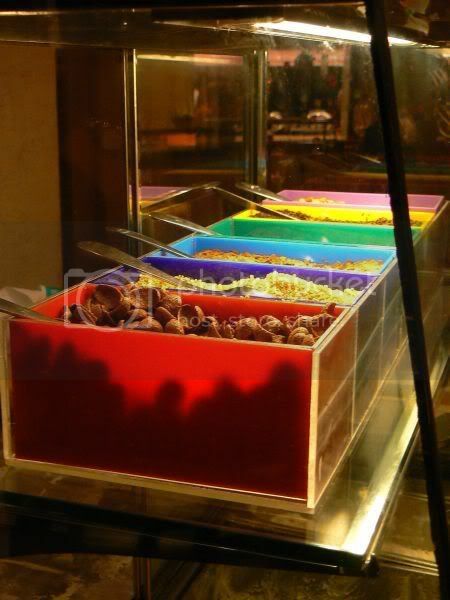 Buffets are often difficult to review because everyone have their own preferences. I personally think the buffet at Latest Recipe offered a good deal for the price you're paying, since it is a wide variety of items even though it had a few misses. It will be great for a place to hang out with family and friends, as the selection of food here can definitely keep every one busy for a few hours. Even though it was a weekday night when we dined here, the place was packed with people checking out the place. Service is efficient but I wish they adopt a better system for making sure our cutlery does not go missing. Maybe a side plate is needed for them to ensure the cutlery is placed at one side, while the clear the plates. More sweet items - this time round, home made pineapple jam cookies whipped up last weekend for Chinese New Year. My mother and I were trying out a recipe she recently learnt. Pretty simple to make and the pastry is very good especially when hot from the oven. It's easier to handle compared to our usual Pineapple Balls recipe. The flaky pastry is good because of it uses very little moisture except egg yolk and of course, loads of butter. Give it a try when you have time. The jam within is from the Pineapple Balls recipe. We originally wanted to shape the cookies to look like pineapples but it got to be a bit of hassle hence we just decorated it with the knife. Measure butter and cut into small cubes. Add in mixing bowl. Sift plain flour and a pinch of salt over butter cubes. Using your finger tips, rub in the butter and flour. You can also use a food processor to mix this together. You will get a crumbly mixture. 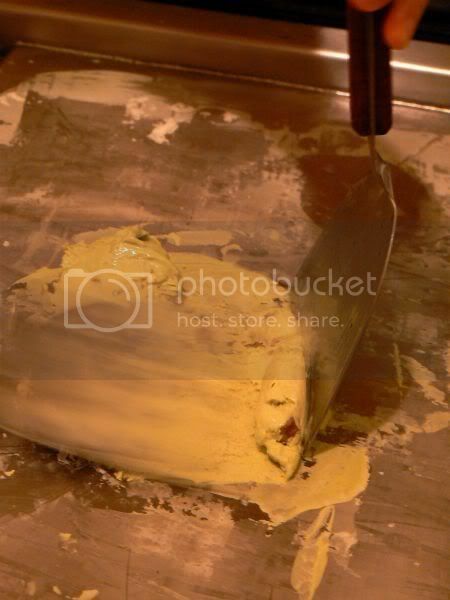 Add egg yolk and mix till it forms into a smooth ball of pastry. 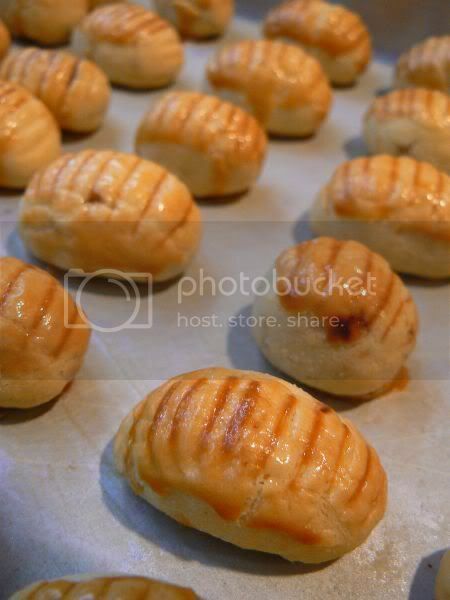 To make the cookies, you pinch a ball of pastry and roll it till smooth on the palm of your hand with your fingertips. Flatten the ball on your palm till thin and add the pineapple jam (rolled up in small balls). Wrap pastry over it and pinch off any extra. You want a thin layer of pastry only. Roll the pastry again till it is completely smooth and round. Decorate accordingly. 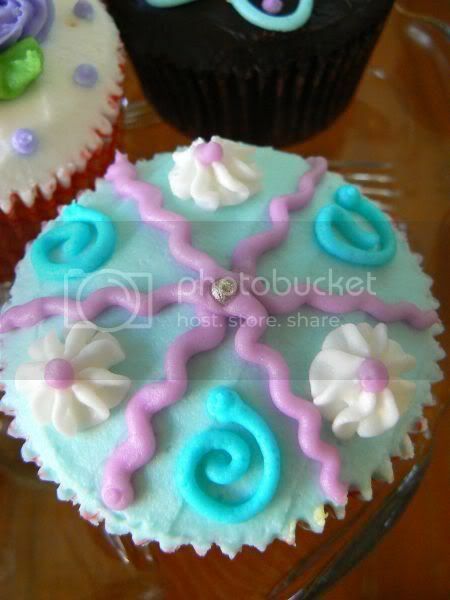 You can use a small scissors to cut the pastry to resemble a pineapple or just use a fork or knife to create decorative dents. Brush with egg on top and bake in a preheated oven of 180C for about 20 minutes. I confess I have a weakness for pretty and cute stuff! 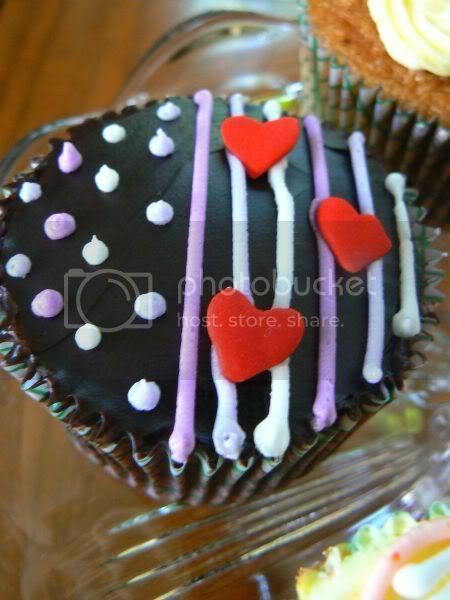 Ever since, I read about Pretty Frosting in the NST and ling239's blog, I have been itching to try their cupcakes. My first attempt was met with dissapointment as the stall was not opened one Sunday since they were busy for an event. Luckily I went back another time, as I struck gold. I was speechless when I saw their pretty cupcakes - everything looked so fantastic, I had a hard time limiting myself to just 6 cupcakes. There's 4 varieties available - plain butter, orange, carrot walnut and chocolate. All of the cupcakes are RM3 except the carrot walnut, which is sold at RM3.50. 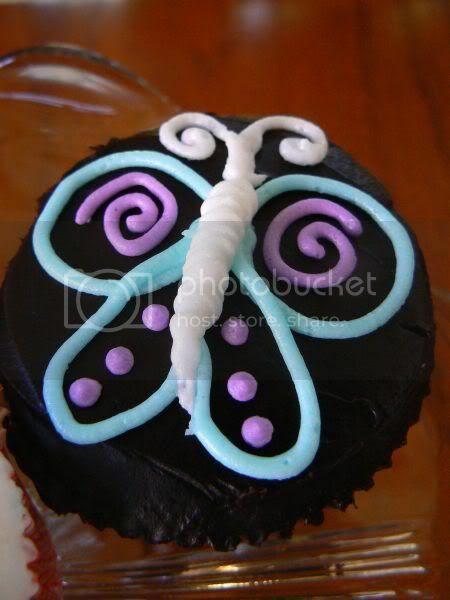 They're not too big - about 3 1/2 inches diameter and about 1 1/2 inches tall. I brought these home for desserts and my mother loved the carrot walnut cupcake. Very fresh, and not too sweet. I liked the soft texture of the cake. The chocolate one was very good too - soft with a not overly moist crumb. That particular flavour was Splashie Boy's favourite. 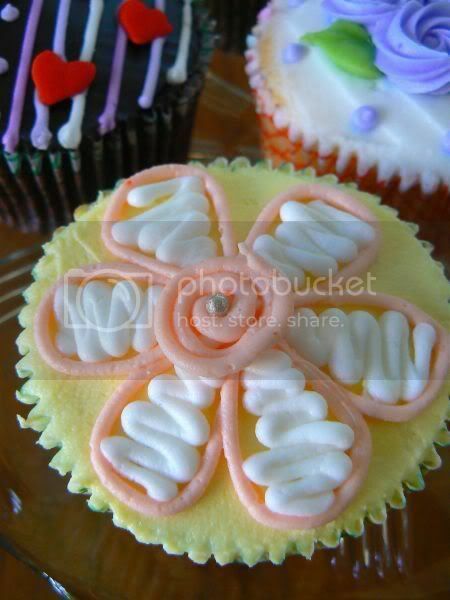 The orange cupcake had just a hint of orange flavour while the butter cupcake was pretty ordinary tasting. 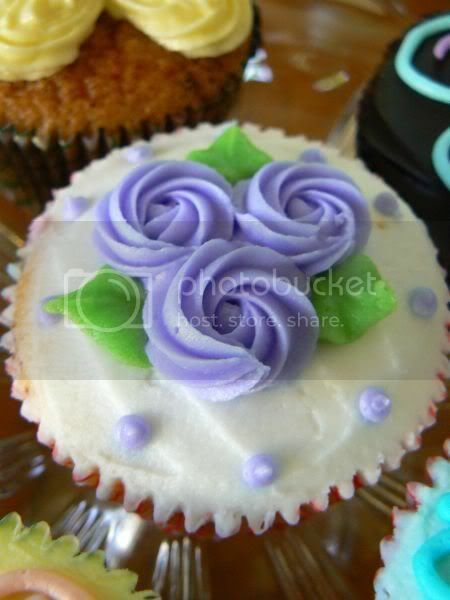 Texture of the cake was not as light compared to the carrot walnut cupcake. 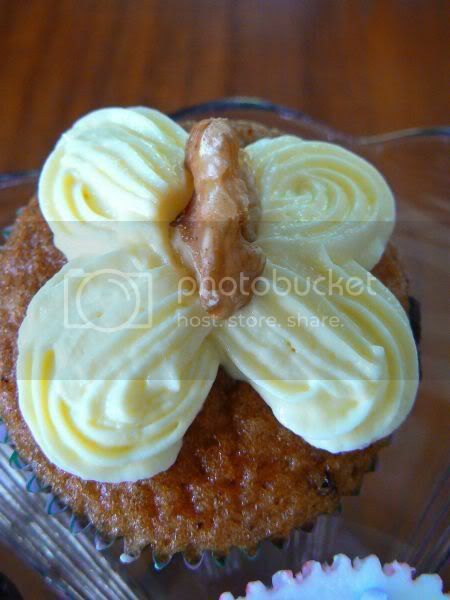 I reckon I'm hooked on their yummy carrot walnut cupcake. Drop by during the weekend at Amcorp Mall and grab a few. 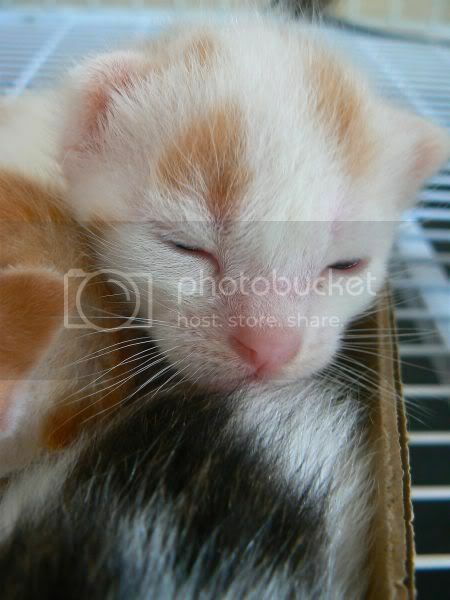 I thought I'll share with all of you, pictures of the latest addition in the house - kittens. All very adorable and cute. Still finding their way around and sleeping a lot. 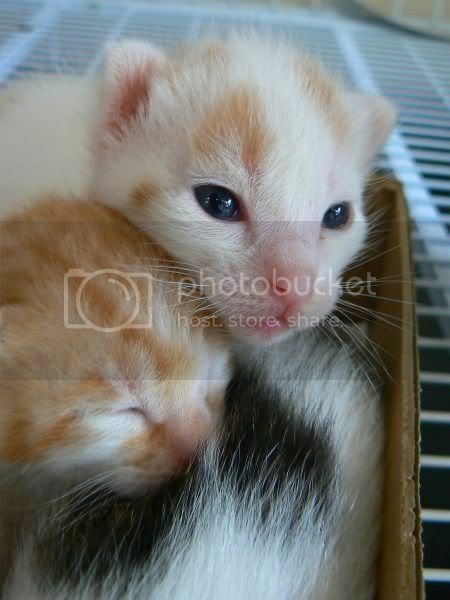 They're from the cat abandoned by the neighbour. Luckily we caught her in time to give birth in the cage so we can domesticate these babies. It is also appropriate as their old house has been torn down for renovations. It is fun to watch them slowly grow. 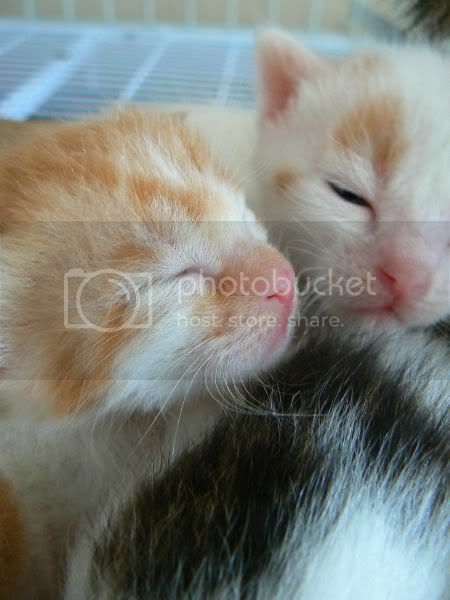 They are getting used to life together and get into little fights among each other. They growl and even bite each other's ears! Sleep in utmost in their mind. 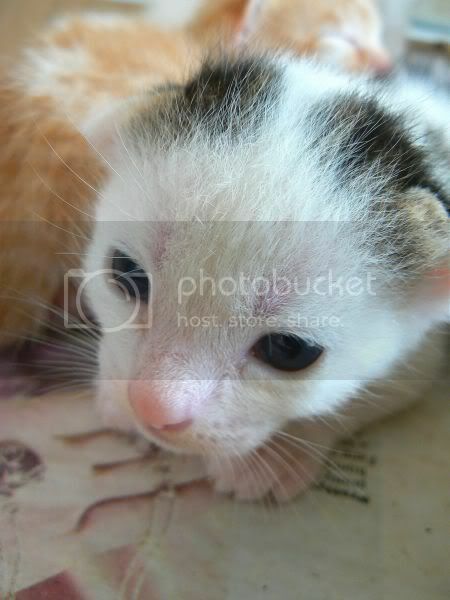 If you wish to give them a loving home, do contact me at boo_liciouskl@yahoo.com. This weekend's WCB is hosted by the Tuxedo Gang Hideout. Hop over to say hi to the kitties. Call it the typical new year resolution but I recently, had a brilliant idea to revive Sunday lunches at home. Must have been the influence from the Asian Food Channel, which plays Ramsay's The F Word but I got swayed to purchase Gordon Ramsay's Sunday Lunch one day. I went through page by page of the cookbook and decided to tackle the first Sunday lunch - Mediterranean flavours. 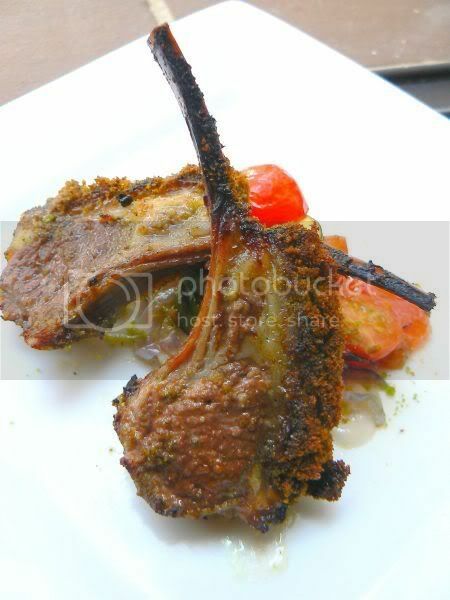 Actually I was attracted to the idea of cooking rack of lamb, something I have yet to attempt. I started out with the first course, the scallops. An interesting combination of flavours, the scallops are served on a dollop of cauliflower puree, a caper and sultana dressing and vinaigrette. Although this dish wasn't too perfect (I had not seared my scallops enough), we both voted this the best item. I liked the slightly tangy caper and sultana dressing with gave flavour to the bland tasting but creamy cauliflower puree. Even the vinaigrette went beautifully with the whole combination. Even though I had halved my portions, I had loads of puree and dressing to go around. I also liked the rack of lamb but we had quite a few problems trying to cook it. Even though recipe called for 10 to 15 minutes, it took a while in the oven. I didn't want my lamb to be too pink, hence we may have over-roasted it a bit. Next time, I reckon we will get it A-perfect. 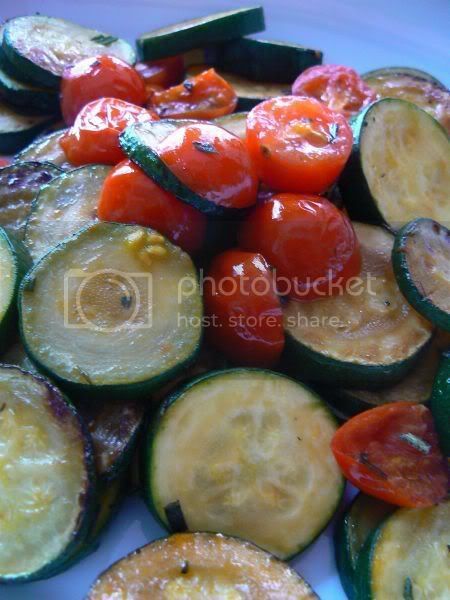 The sides like the courgettes were yummy even though I had forgotten basil leaves in it. I didn't really like the pommes boulangere. 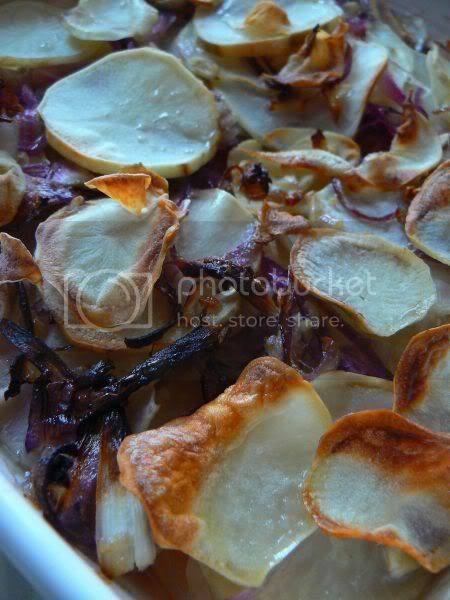 Maybe my potatoes and onions weren't covered enough with stock as some bits weren't cooked and dried out. 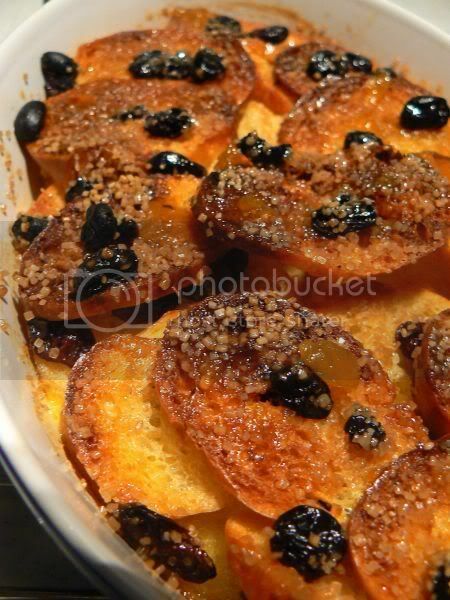 For desserts, we had the baguette and butter pudding. 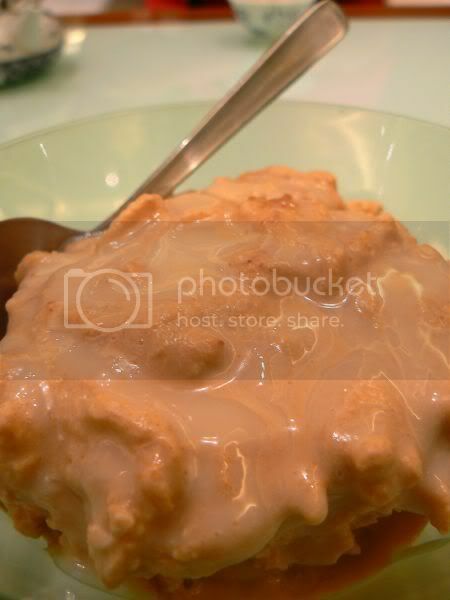 Since I had used quite a high baking dish, my custard didn't cover the whole pudding, hence the top was extra crispy. I liked the eggy bits at the bottom, which went well with cold ice-cream. Am not too sure if I am up to cooking for others at the moment as I reckon, I need more practice! Hopefully the next menu I pick is easier as I definitely need a sure winner to serve when friends come over for lunch. Let the feasting begin.......! 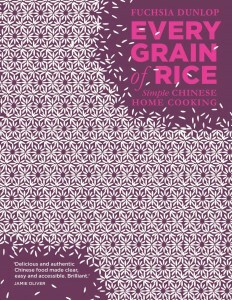 Chinese New Year is definitely round the corner as the feasts have started. We kicked off the crazy season of indulging our stomachs with the Big Bowl Feast aka Pun Choy during the weekend. 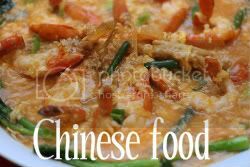 More common in Hong Kong, this dish recently gained popularity on our local shores. Be warned though, this item is not for all. For those who hate their food messed up or touched by others - this is definitely a no no. 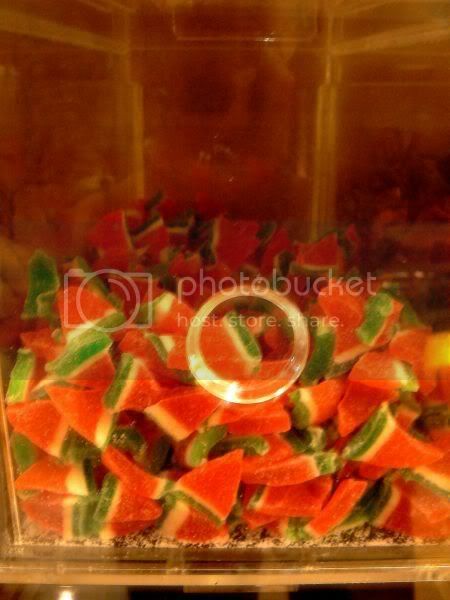 Actually it ain't nothing much - just layers of various types of food plunked in one bowl. In this particular restaurant, instead of a deeper gold basin, they use a flatter stainless steel basin. Finding this out of the way restaurant is also a big challenge especially late at night. Street signs are not that clear, hence you may experience a few wrong turns. Once you reach the place, you'll be confused further as they operate from 2 restaurants near each other. Seems one side just serves Pun Choy while the other is for other types of cooked food. So what's in the huge pot, you ask? Food to serve more than 12 people! 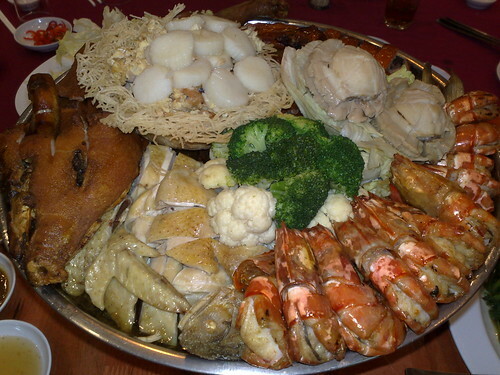 You get scallops fried with eggs and fake sharks fin and placed in a fried meehoon basket, two abalones, 12 tiger prawns, half a roast duck, half poached chicken, part of a suckling pig, ma yau fish (the bones are done away so you don't get bones stuck down your throat), broccoli, cauliflower, braised chicken feet, braised pork and bean curd sheets, konnyaku jelly threads (any other noodles would have absorbed the sauce and expanded), chinese mushrooms and clams. The huge platter is placed on a portable gas stove and heated up. As instructions weren't too clear from the waiters, we were at a lost on how to eat this. We tried eating it layer by layer but after we discovered the tempting flavours of the braised meats under the first layer, everyone started digging downwards. I liked the braised meats the best as the sauce was yummy. Ate half a bowl of rice quickly as the sauce was delicious. Aside from serving this at the restaurant, you can also buy back the big bowl feast and heat it up at home. Continuing my Petaling Jaya trail of great food is this particular mamak stall. Located at Restaurant Sun Fatt Kee, just across from Seapark market, business here starts when night falls. They share the premises with a bak kut teh stall and during the day, you can get excellent Teochew porridge here with fried clams, assam fish and etc. Seems they're well known among PJ-ites and is also known as the "Maybank mamak", since they're right in front of the bank. Tables and chairs will be set up around the shop and even outside on the side of the road. Every night it is super packed with people and it seems business is so good, they only close for 3 hours on Sunday! Talk about working your workers to the bone. Everything about this place impresses - good food, great prices and quick and efficient service. I love their drinks, a bit too much crushed ice but the taste of their Air Limau is good, with a slight sharpness versus those watered down sugary versions you usually get at the mamak. I sampled the nasi lemak with fried chicken. Thumbs up to the rice, which had a tantalising aroma of coconut milk. Sambal was spicy but not overly tongue numbing. 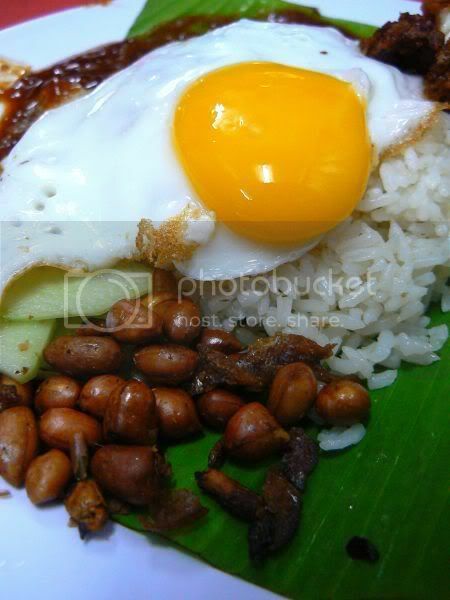 Topped with an egg with a runny egg yolk, it was good stuff at only RM4.50. 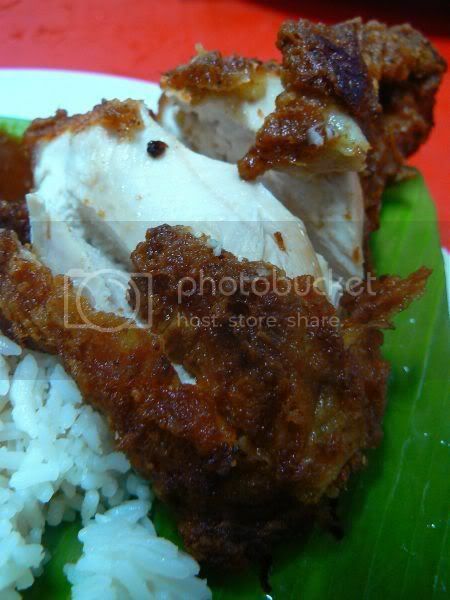 I love their fried chicken too - juicy chicken meat with a crisp coating from the batter. 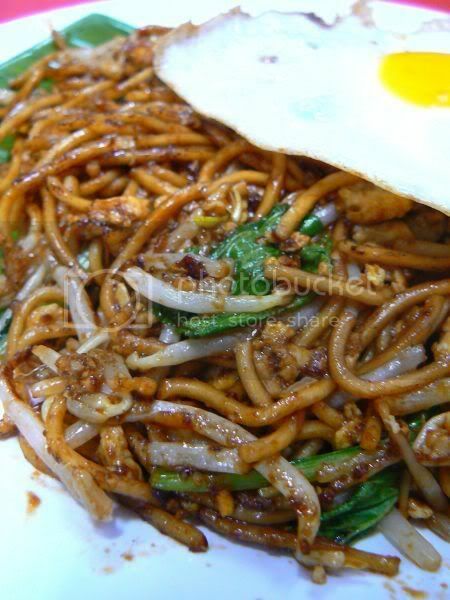 Splashie Boy had their Mee Goreng (RM3), also a favourite. I managed to steal a few strands before he finished it. Thumbs up too. Do give a try and many thanks to my friend, S for pointing me in this direction. I reckon, I'm truly a Petaling Jaya girl at heart. Even though I live in Kuala Lumpur now, I still inevitably find myself trawling the streets of Petaling Jaya for food. 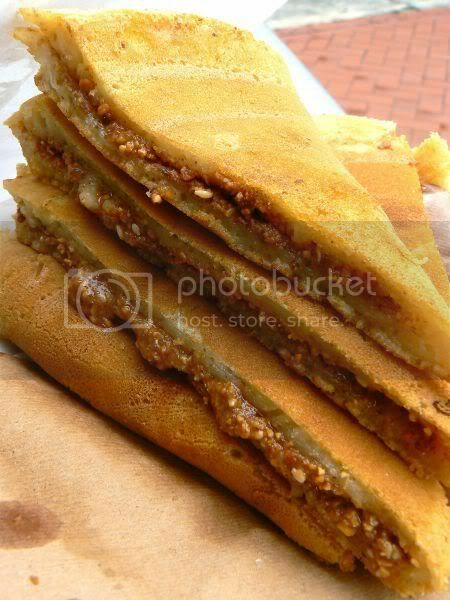 One of the stalls I grew up eating at, is this apam balik stall located next to Seapark Market. Since Seapark Market was the middle point of a daily school route for my mother, she used to frequent this place for her vegetables, meats and supplies. Just at the side of the market, in the morning when it is bustling with people is a small lane filled with stalls selling nasi lemak, fried noodles, local kueh, soy milk and tau fu fah and this stall, which sells apam balik. Run by an old couple, the stall has been in existence for almost 20 years plus. You queue up to order your pancakes - whether it is a whole one or a piece. The husband will prepare the pancake by cooking a thick gooey mixture on hot plates. Usually they do two pancakes at one go. 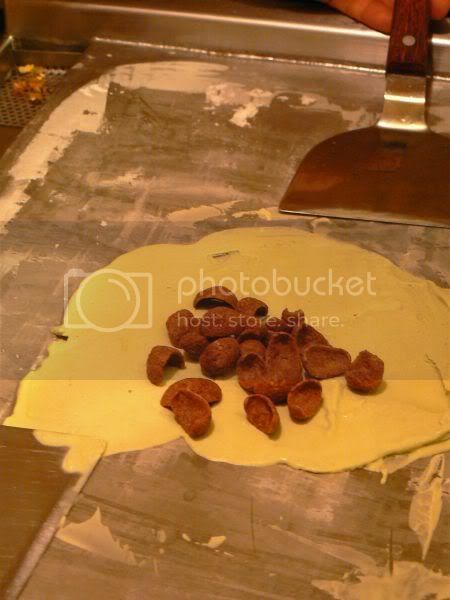 Here, the apam balik is a bit thinner than the other stalls as they will press down the batter with the back of a spoon. This helps cook the pancake faster also. Once it is half cooked, he liberally sprinkles it with crushed peanuts and sesame seeds. I always ask for extra peanuts till it oozes from the sides of the pancake slices. 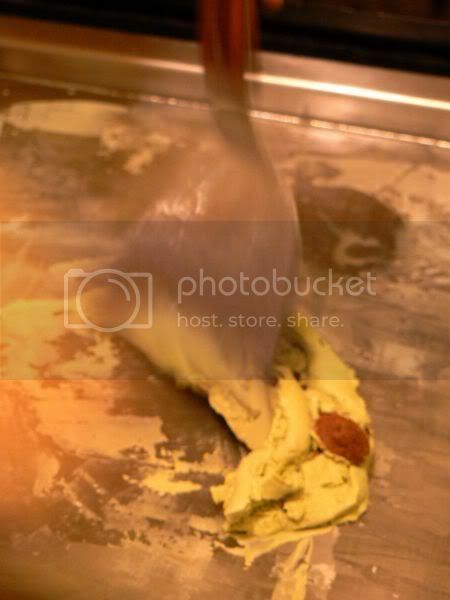 Another unique method they use, a small fan to cool down the inside of the pancake, once it is removed from the hot plate. This prevents it from getting soggy after they pack it. 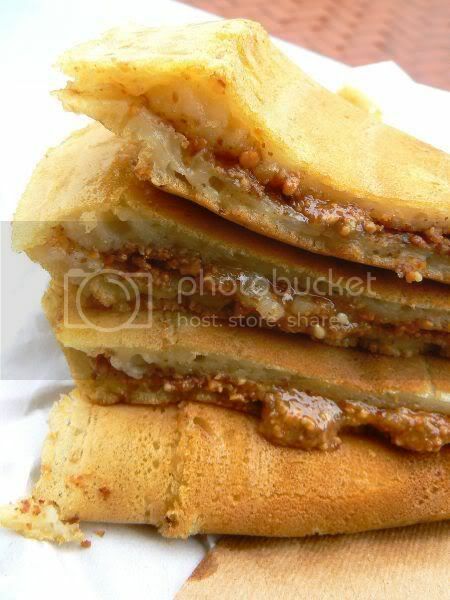 I can never resist the wonderful aroma of the just cooked pancake, hence I get burnt fingers or scattered peanuts in the car since I will be munching on each piece before reaching home. Do give it a try as it is extremely delish. 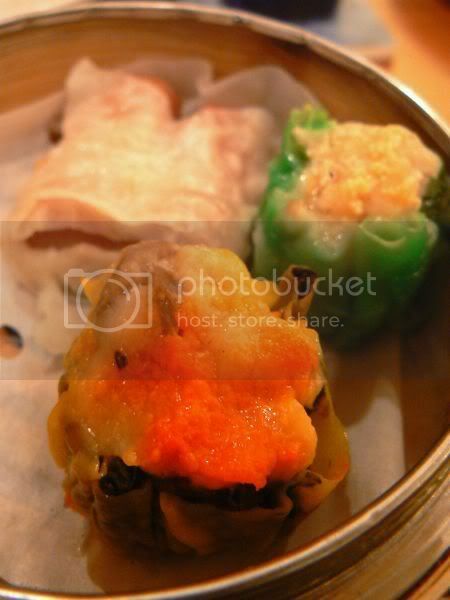 I have been a fan of Fong Lye's food at their Desa Sri Hartamas outlet and even blogged about it twice. Recently, they have opened a new outlet at The Gardens. Looking modern with white furniture and flower motifs in purple, it is a good place to relax after some shopping. Unlike the other outlets, which serve cooked dishes with rice or porridge, this outlet features more snacks and set meals. Every set meal ordered is served with a variety of items. 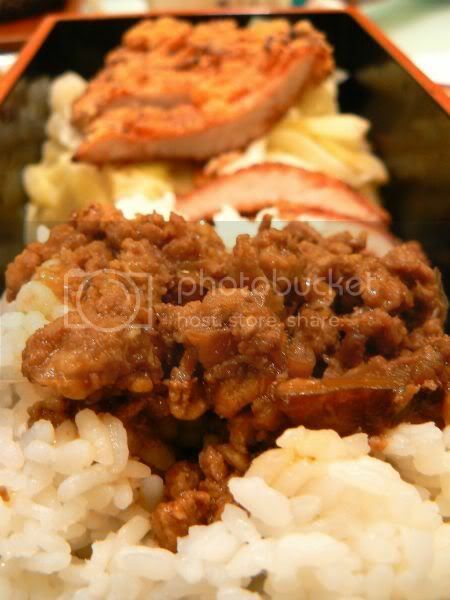 One of the items served with the set meal, is rice topped with minced meat. Very nice and delicious as it reminds one of home cooked food. 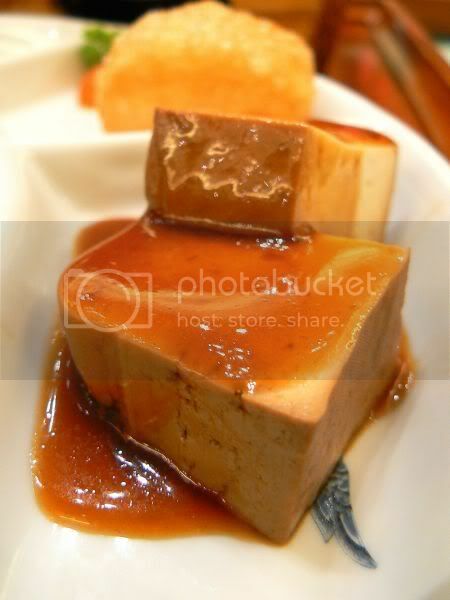 There is also braised tofu, with a light sauce. 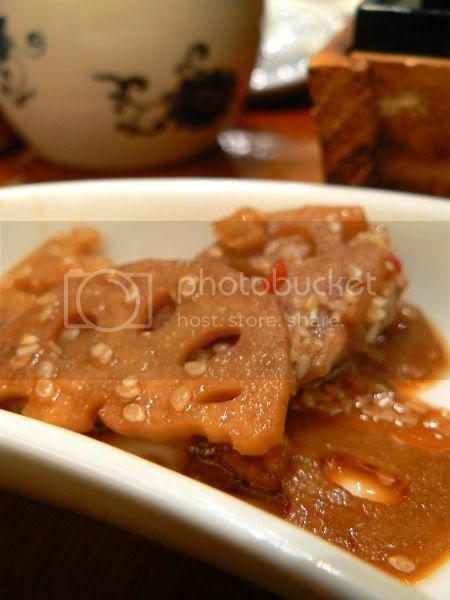 Also in the set meal is sliced lotus roots fried with lots of sesame seed. 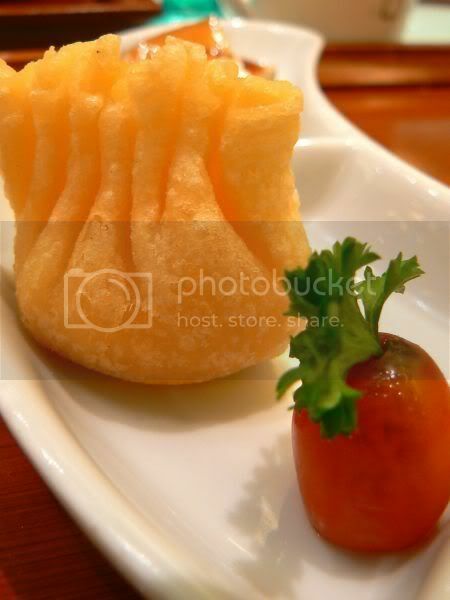 There is also a crunchy prawn puff and a small bowl of soup. 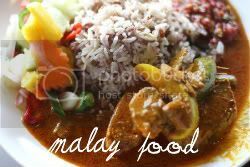 Although the prices here to be quite high (set meals range from RM13.80++ to RM28.80++), they make up for it with good quality food and attentive service. 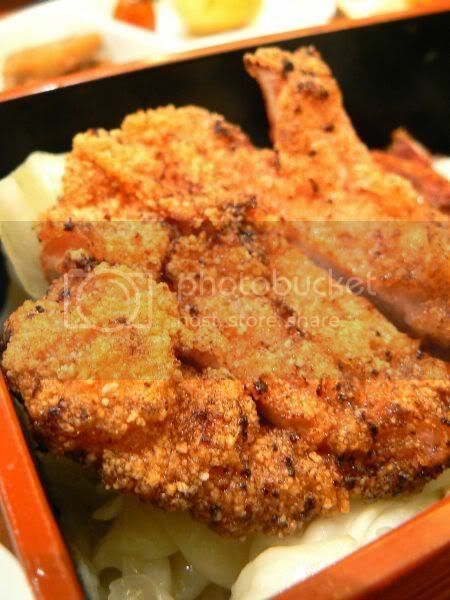 A few of their signature dishes from the other outlets are also available here - the 3 Cup chicken. 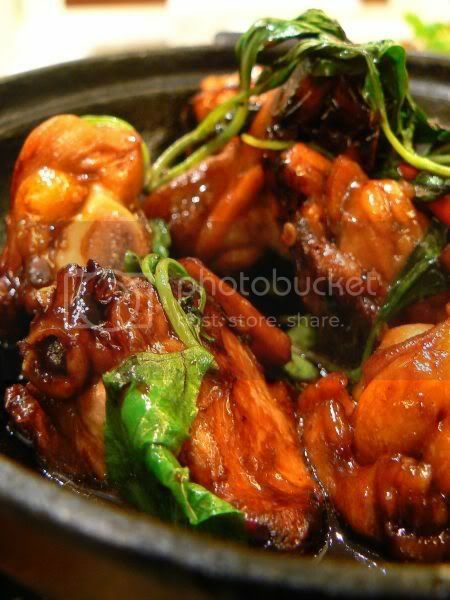 Very aromatic especially with the fresh basil leaves they add, when it is served on a piping hot bowl. 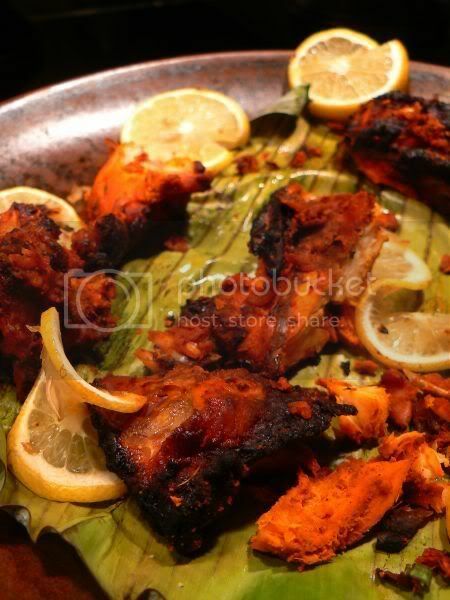 The chicken is served in a bowl, which is kept warm over a small fire. I ordered the recommended spare ribs. Very nice stuff indeed. The meat is tender with a crispy coating outside. They're boneless and kinda remind me of eating a very tender pork chop. 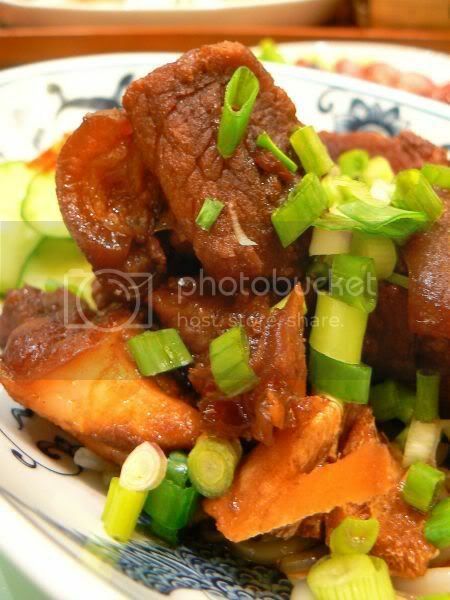 Also ordered was the pork rice set - stewed pork pieces. We expected tender pieces of meat but they weren't braised enough and the meat was quite lean. Since there were so many of us, we also ordered snacks to try. I was fascinated to try their Taiwan Burger (RM7.80++). Unfortunately it didn't turn out great. 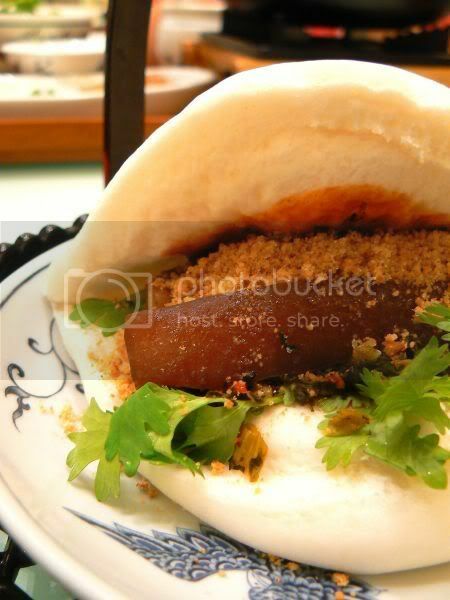 It's just a piece of stewed pork wrapped in a steamed mantou. Didn't taste so good as the stewed meat was too lean and dry. We also ordered another classic Taiwan dish - baked sausages (RM5.80++). 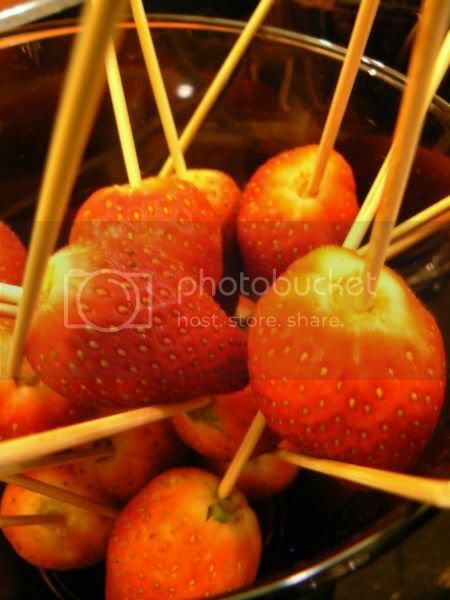 You can get these at most roadside stalls or pasar malam. We thought the taste of the sausages weren't too fantastic versus what you get at the SS2 pasar malam. Aside from these items we ordered, the menu has steamboat sets (a choice of beef, mutton and pork). We spied one couple in the next table having it and the steamboat is pretty tiny. Other popular dishes like the Taiwan Braised Beef served with glass noodles, Taiwan Style glutinous rice and Sa Cha fried beef noodle. Usually they serve Mee Sua with oysters like Shihlin but Fong Lye's version is served with intestines. 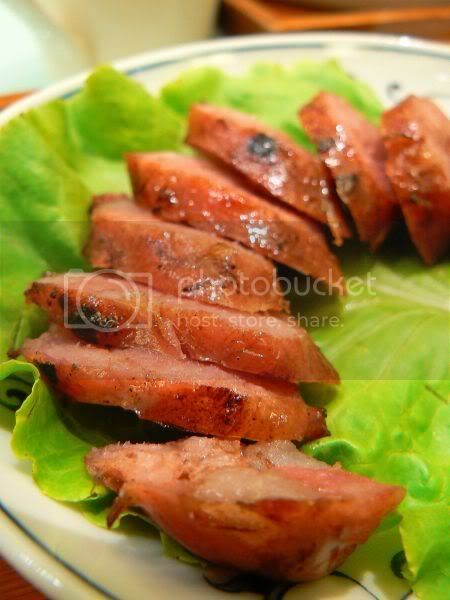 Also available is Tea Smoked Duck. Snacks are also available if you just want a quick bite - there's hot and spicy dim sum, Taiwan sausage served with glutinous rice, fried tempura, salad bread and coconut milk toast. For desserts, you get a variety of icy cold snow mountain with mixed toppings or this peanut version we had. Thumbs up to this! Very nice but a bit creamy as they drizzled milk on top of it. It literally tastes like eating peanut butter except it is cold and soft. They also serve ice red bean, ice green tea and ice strawberry milk. One thing I realise about this place, everything is extremely pretty or cute. 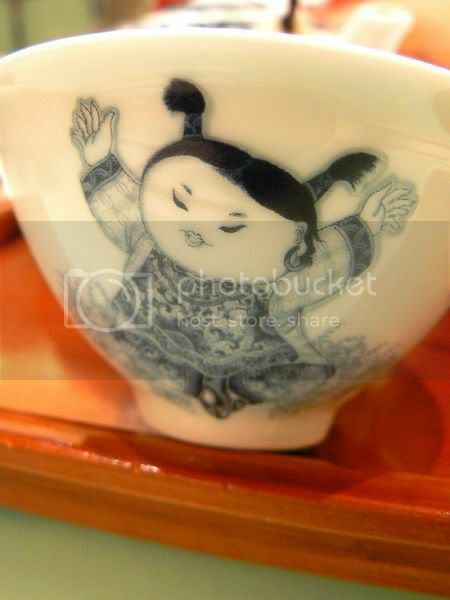 I love their teapots and teeny cups with the motifs of kids and phoenix. Also very cute is their mugs they serve their tea in. It features a cute doggie with a wagging tail at the back and front. 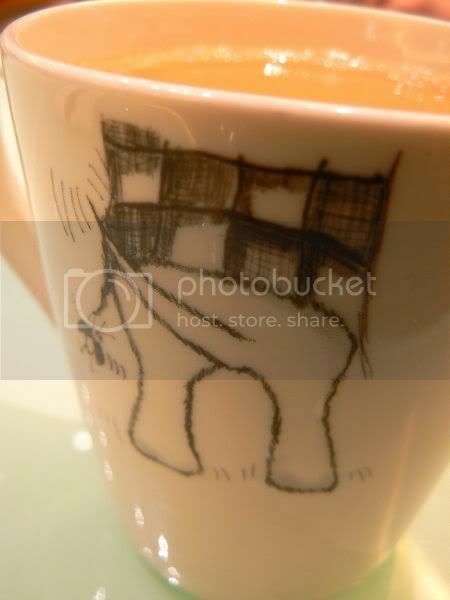 The milk tea is very nice and aromatic too. If you order tea, it is refillable. They also do iced oolong tea, which is very refreshing.